So, here I am. Back in Cleveland. Home of the Cleveland Browns. Host of Content Marketing World. And a bunch of people happy to wear orange. Jay Baer of Convince & Convert in a nice pair of orange shoes. Jani Byrne of IBM in an orange dress (I think), and Brad Walters from Lowe’s refusing to wear orange because it’s a competitor’s brand colour. The topic? Content atomization: Making more content from less through smart planning. I thought this would be a good one. And it was. Because it is so easy to focus all efforts producing that ‘killer’ piece of content that you think is going to be the answer to all our problems. The simple fact is, you need a consistent, systematic approach to incrementally create more content from every piece of ‘brick’ content. Brick content is the key piece of bedrock content that ‘feathers’ can be created from. Bricks are heavy. People won’t want to throw them away but they take more time, effort and money to produce. Feathers are lighter, quicker to produce and at less cost. 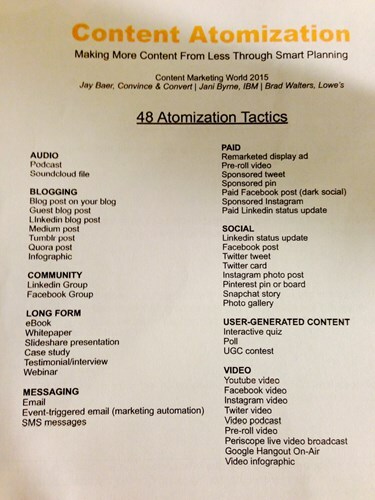 This reinforces what Jay said – that content atomization is not an option. Especially when you consider that 70% of B2B companies expect to produce more content this year. So what do you need to do? To execute content atomisation in a resource efficient way you need a Big Idea first and to then execute and release content in strategically sound ways. Turn blog posts into slideshares. Jay Baer thinks slideshare is a great channel for lead generation. Take video and use the audio for a podcast and the transcription for a blog. Turn depth research into video, slideshare, infographics, checklists and blogs – and use them through the Buyer Journey. It works for IBM. Once you’ve made your big piece of content, that isn’t it. No point doing the high fives. If you think you’re finished there you’ve got another thing coming. This was one of my key takeaways. At LBDGA we have a lot of great content in our Resource Centre, so I asked Jay, “Can you go back and create feathers from old bricks”? And the answer was a resounding yes. Provided the content is still relevant and still of value to the audience. Once you’ve done that, you also need to ‘market your marketing’. Do some research on the intended channels. Consider if you belong (does it fit with your brand). Understand who you would be talking to. Check you have the resources to execute. Consider the content you would use. Make sure you can add value. Brad showed some awesome Vine examples. Lowe’s Fix-In-Six. Perfect in his B2C environment. And something we can all learn from: Well planned. Shot on an iPhone. Highly engaging. They inspire and motivate. And enhance brand reputation. Why wouldn’t you! We are all investing valuable resources generating brick content – so why not maximize the opportunity to generate demand by investing a little more time and money creating a few feathers? It’s the feathers that will tickle the different audience’s fancy. 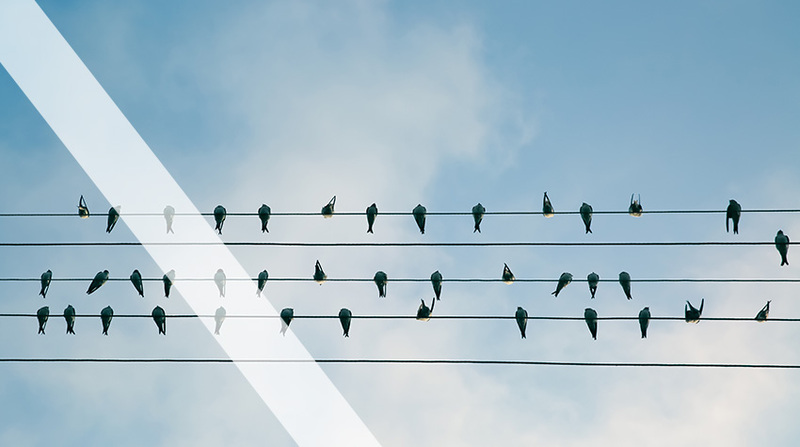 Atomization will allow you to be seen in more places, and improve your chances of giving your prospects a reason to engage. Have a plan. It’s so easy to deviate from what you should be focusing your efforts on doing. Finally, when someone says, “We need a new guide to setting the world on fire”, think before you say yes.